This statistic shows the annual worldwide revenue of Sabre Corporation from 2012 to 2017, by business segment. 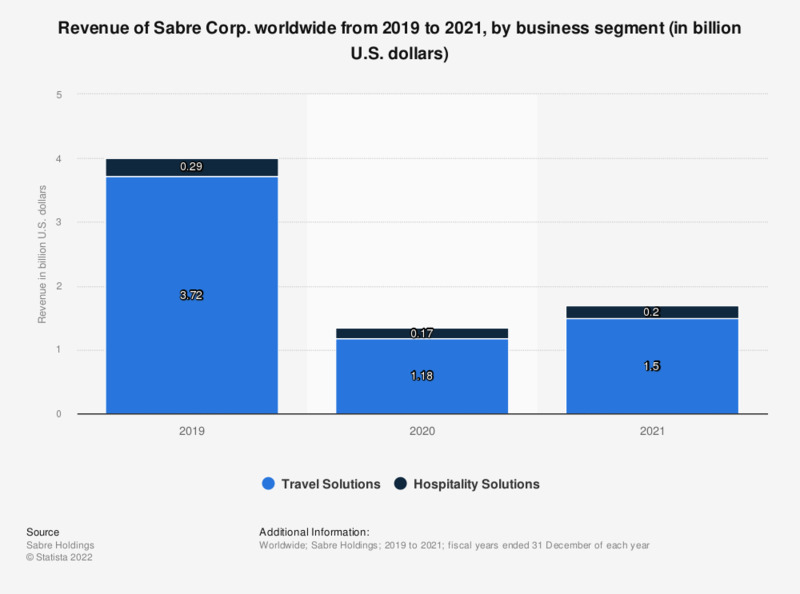 In 2017, the travel network segment of Sabre Corporation generated 2.55 billion U.S. dollars in revenue. The total revenue of Sabre Corporation includes includes financial eliminations from the segment revenues, meaning the total revenue of each year was less than the combined revenue of the segments. The eliminations for each year are as follows: 2012: (10,000,000 U.S. dollars); 2013: (9,697,000 U.S. dollars); 2014: (9,846,000 U.S. dollars); 2015: (13,982 U.S. dollars); 2016: (20,768 U.S. dollars)); 2017: (26,346 U.S. dollars).